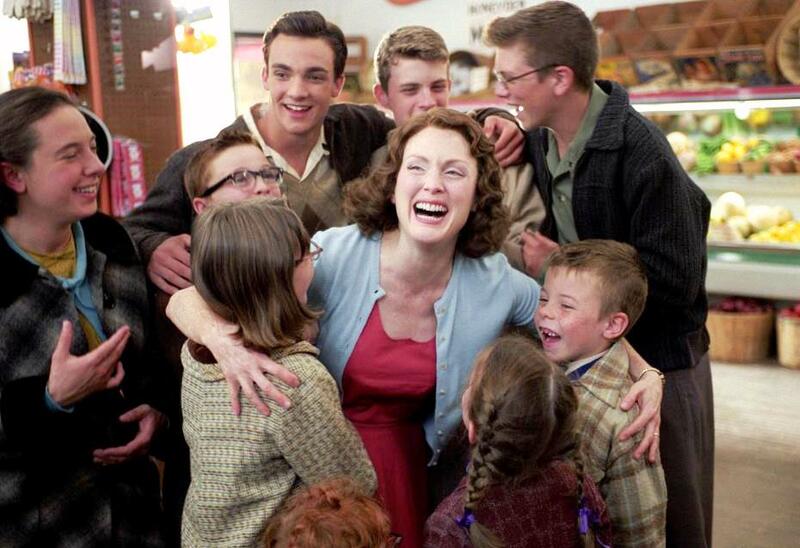 Up until now, “The Tree of Life” and “Far From Heaven” have long been for me the two best films about 1950’s life. 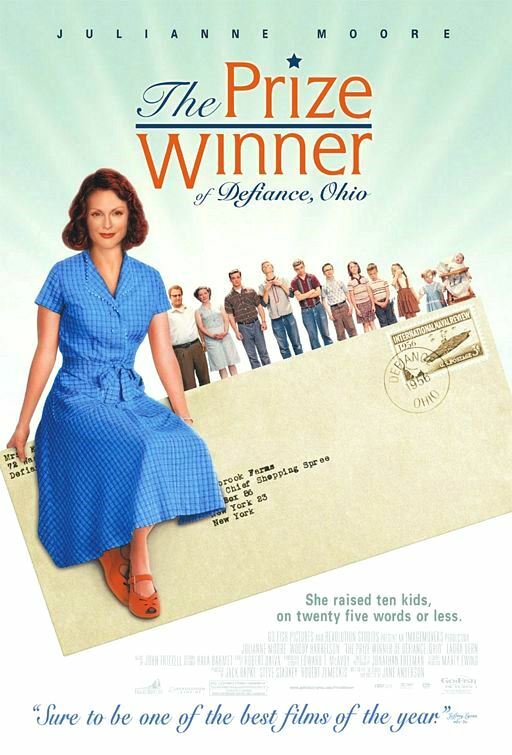 The Prize Winner of Defiance, Ohio (2005), a completely overlooked gem with Julianne Moore as a stay at home mother who feeds her family of ten by winning contests, needs to join the company. When I was young I was vaguely aware of a past era when people won prizes from home by supplying commercial slogans and jingles for big companies (today, you have to go on a game show). Based on a memoir, the story here is an ebullient reverie of that time. Moore is phenomenal once again (1950’s roles suit her) as the almost always unflappable mother who can change diapers, give kids baths, cook meals and negotiate payments with the milk man – all seemingly at once. She is bogged down by her husband played by Woody Harrelson who calls her at all times “mother,” not wife. For a few moments it is a quirky sight to see him throwing a fit over a Red Sox game that he hears on the radio. Then the tone emboldens, and we gather how his temperamental six-year old rages have silted the family. Harrelson, as this denial alcoholic, gives another great underrated performance. Who enables his drinking habit, by the way? The local cops and the priest who too easily side with him on his revere for the Red Sox. “Defiance, Ohio” is a comedy-drama of highs and lows, and it deftly blends the comedy with the harsher moments. Moore’s character Evelyn Ryan wins deep freezers, trips, cars, bird feeders, pogo sticks, supermarket sweeps and cash prizes which are necessary to pay her mortgage since the hubby drinks away his paychecks. Evelyn does this all from home, and she never leaves her home, we realize. Several years into the story she gets an invite to travel some ninety miles to visit a “rival” contester (played by Laura Dern), who has become a pen pal, to meet her and all her friends. Conventional wisdom is that this pushy Dern character wants to meet Evelyn so she can steal all of her ideas, and that Evelyn is all too willing to go let her guard down because she’s lonely. That’s also conventional movie plotting, but the movie had another thing coming for me. Instead, it’s a snapshot of 1950’s housewives coming together in sorority. Harrelson’s “father” is all too quick-triggered for jealousy, and he’s a far more trickier case of reproach than Dennis Quaid’s character in “Far From Heaven” or Brad Pitt in “The Tree of Life.” Evelyn Rose is quite an ordinary 1950’s archetype in a way, but she’s required in many poignant ways to save her family and keep them afloat. I was amazed by how much I enjoyed “The Prize Winner of Defiance, Ohio.” Embrace the title. Directed by Jane Anderson (writer of “The Positively True Adventures of the Alleged Texas Cheerleader-Murdering Mom”) with a peerless insight into the past, and the memoir was written by Evelyn’s daughter Terry Ryan. Film Cousins: “Desert Bloom” (1986); “Far From Heaven” (2002); “The Tree of Life” (2011); “Carol” (2015).